First time to register on this site? We recommend that you first set up a permanent student profile before registering for a class. This way, your class history will be saved in one place and all of your forms will auto-fill (once you log in). 1) On home page, subscribe to receive announcements. 2) In the blue box, click on "profile" and fill out the form with your contact info. 3) You will be sent a link and may log back in and update the password. 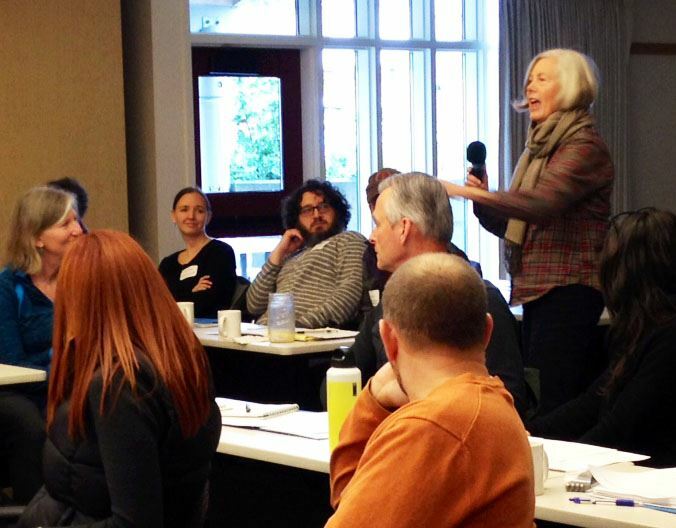 This two-day course will increase your ability to design, conduct, and control meetings in public forums. This course is designed to increase your ability to plan and facilitate a meeting (or a series of meetings) that minimize conflict and enhance problem solving. Collaboration is often cited as a good way to address coastal resource management issues, but the collaborative process is complicated, requiring a systematic approach. 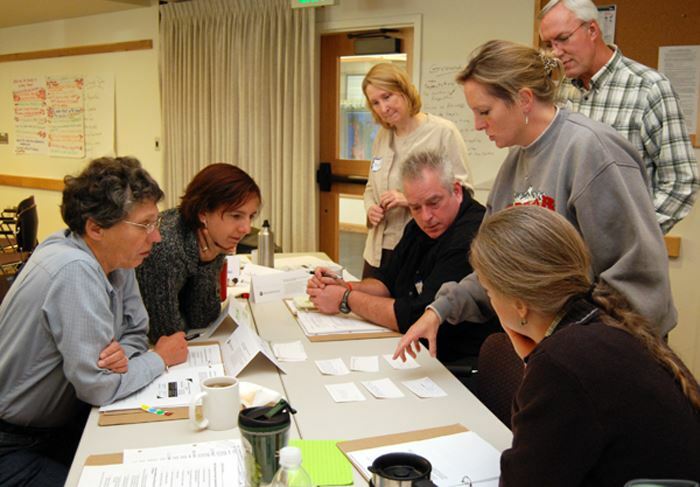 This course provides the skills and tools to design and implement collaborative approaches. The skills will be useful even when attending, but not running, a collaborative meeting. Instructors: Jan Kuklick joined NOAA's Office for Coastal Management (OCM) in June 1997 as a coastal management specialist. She has been working in the field of coastal and marine science since 1989 and has extensive experience in facilitation and meeting coordination and management. Before joining OCM, she worked in the area of oil spill response, damage assessment, and contingency planning. She holds a master of science in marine biology from the University of North Carolina at Wilmington and a bachelor of science in biology from the College of William and Mary. Gwen Shaughnessy brings a background in marine biology and non-traditional education to NOAA’s Office for Coastal Management (OCM), which she joined in 2011. In her current role as a Senior Coastal Management Specialist in the OCM Engagement, Training, and Education Program, she is the national coordinator and lead trainer for a two-day climate adaptation training course. Building capacity in local communities to better understand the risks, strategies, and choices for how to adapt to the impacts of a changing climate is a focus of her work. Instructor: Annie Szvetecz has been a senior planner and policy analyst for Ecology since 2004 and currently oversees the statewide administration of the State Environmental Policy Act including the statewide Register, rulemaking, guidance, training and technical assistance. She has a master’s degree in Environmental Studies from the University of Montana and a J.D. from Lewis and Clark School of Law. Do you speak at conferences, public meetings, or other events where you need to convey a specific message? Have you ever felt like you didn’t quite hit the mark by the lackluster reactions of your audience members? Would you like to authentically engage people and help them to consider a different point of view? This two-day class (Feb 13 & 27) features best practices for designing presentations and is especially geared towards scientists and professionals who work for local and state agencies. Cathy Angell coordinates the Coastal Training Program and has a long history of designing and delivering presentations, as well as coaching others. She specializes in presentation skills for educators, scientists, and public officials. A former member of the National Speaker’s Association, she has presented at conferences, colleges, business organizations, and retreats. She recently received a communication award from NOAA named in her honor. Nicole Faghin is a Coastal Management Specialist at Washington Sea Grant. She is a trained land use and environmental planner and lawyer specializing in waterfront planning issues. Nicole is a frequent lecturer for the Coastal Training Program and on the CTP Advisory Group. She has also taught courses at the UW Seattle Urban Planning Program, UW Tacoma Urban Studies Program, and has been a guest lecturer at the UW School of Marine and Environmental Affairs. If the class is full, please sign up for this waiting list. We will contact you if a space becomes available. This 2-day training provides information and methods for determining the ordinary high water mark (OHWM) as defined in the state Shoreline Management Act (SMA). Waters regulated under the SMA include all tidal waters, streams greater than 20 cubic feet per second mean annual flow, water bodies greater than 20 acres in size and any associated wetlands and deltas. Field visits to each of the SMA water types will give you the opportunity to apply the methods discussed in the classroom. - How is the OHWM defined and where does it apply? - What is the regulatory context and history of the OHWM? - Why it is important to use field indicators to determine the OHWM? - What are the most reliable field indicators on tidal waters, streams, lakes and associated wetlands? - What are some common misconceptions about OHWM determinations? Instructors: Diane Hennessey has specialized in the ecology, protection, and restoration of aquatic systems for 17 years. She has worked as an aquatic resource scientist in private consulting and currently works as a Wetland Specialist for Washington State Department of Ecology. Her work has included stream, wetland, and wildlife habitat studies including delineation of both wetland and stream ordinary high water mark boundaries; preparing, reviewing, and issuing environmental permits; planning, design, and preparing aquatic restoration plans; monitoring mitigation and restoration projects; providing technical assistance in aquatic resource protection and conservation to local governments; and compliance monitoring of permits and violations. She has also been an instructor for the University of Washington-Seattle Wetland Science and Management Certificate Program since 2005 and has taught Wetlands Science and Ecological Processes; and Wetlands Identification and Delineation. Rick Mraz is a certified Professional Wetland Scientist who works as a Shorelands Technical and Regulatory Lead. He began his career in wetlands work in Lee County, Florida in 1987. He has worked as a field biologist and environmental planner with local, state and federal agencies in Washington since 2001. Rick has degrees in Geology, Field Biology and Philosophy. Lynn Schmidt is the Department of Ecology’s Statewide Flood Engineer, focusing on reducing flood risks to communities while enhancing natural floodplain functions. Her career has spanned a wide range of topics within the environmental and hydraulics engineering fields, including hydraulic modeling, river restoration, floodplain management, stormwater management, environmental investigations, and monitoring. Lynn holds a BS in Civil Engineering, MS in Environmental Engineering, and is a Professional Engineer and Certified Floodplain Manager. This two-day class is geared towards those who design and implement compensatory mitigation and restoration projects and/or those who review and condition mitigation plans who want more technical information. This class focuses on factors to consider when designing wetland projects and protocols to help ensure their success. 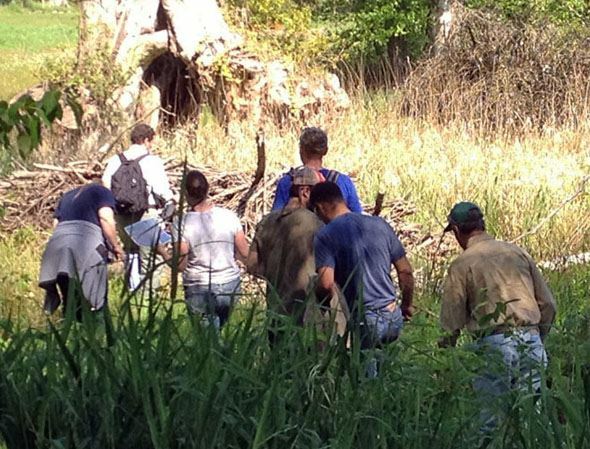 Class participants should already have a general understanding of wetland ecology and regulations. 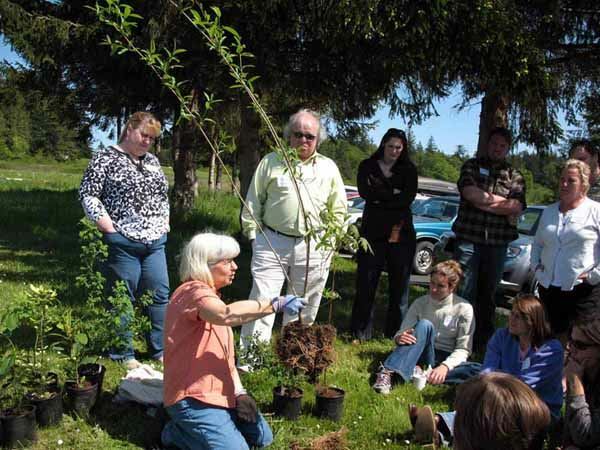 Instructors: Susan Buis is a restoration ecologist and native plant horticulturist currently working for the US Army Corps of Engineers and the WA State Dept of Transportation. She is also co-founder and former co-owner of Sound Native Plants, an Olympia company that provides a full spectrum of restoration services including design, installation, native plant propagation, maintenance, and monitoring. Before founding her company in 1991, she worked for Yosemite and Olympic National Parks, where she developed and managed restoration projects and native plant propagation. Ms. Buis has been teaching workshops in restoration design and installation to professional groups and agencies since 1996 and has published articles on creating restoration plant specifications in Hortus West and in Native Plants Journal. She is a regular guest lecturer on native plant topics in the coastal NW. Lisa Palazzi is a Certified Professional Wetland Scientist (SWS-PCP) and a Certified Professional Soil Scientist (SSSA). She has over 28 years of professional experience evaluating wetlands, soils and hydrology in the Pacific Northwest. Ms. Palazzi has provided expert advice and expert witness services on many hydric soils and wetlands hydrology functions in the Puget Sound region to many different municipalities and agencies. She consistently receives high marks as a teacher from her students and from workshop participants in these subjects, and she has taught in many different settings, ranging from University-level certification courses to professional conference workshops and even as a guest speaker in elementary, middle school and high school classes. Therefore, she is not only technically competent in her field of expertise, but capable of explaining that knowledge to a wide range of audiences. She is familiar with the most common mistakes and misinterpretations of soils and hydrology characteristics made that can cause a restoration project to fail. 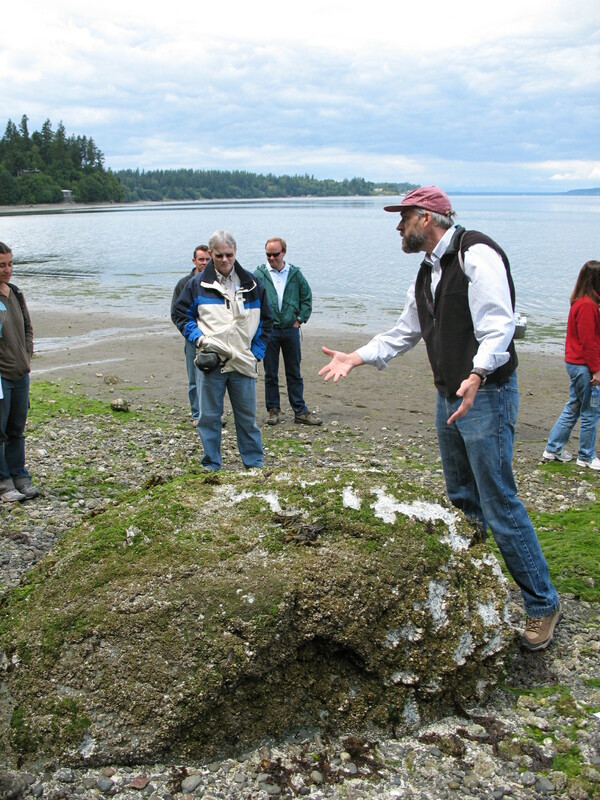 This class reviews the geologic processes shaping Puget Sound beaches, such as erosion and sediment transport, and the influence of human activities on these processes. This year we’ve updated the class to include more emphasis on factors influencing the selection and design of erosion control measures. We will look at a variety of softer techniques that are being used to reduce the impacts of conventional shoreline structures. You’ll learn about recent guidance regarding the design and the review of soft shoreline and beach restoration projects. The class will include numerous examples that help you better understand the factors influencing a particular site and that highlight reasons for successful, and unsuccessful, shoreline projects. Instructor: Hugh Shipman has been a coastal geologist with the Shorelands and Environmental Assistance Program of the Department of Ecology since 1989. His interests include shoreline erosion and longshore transport, coastal hazards, beach nourishment and restoration, and the environmental impacts of shoreline modification. 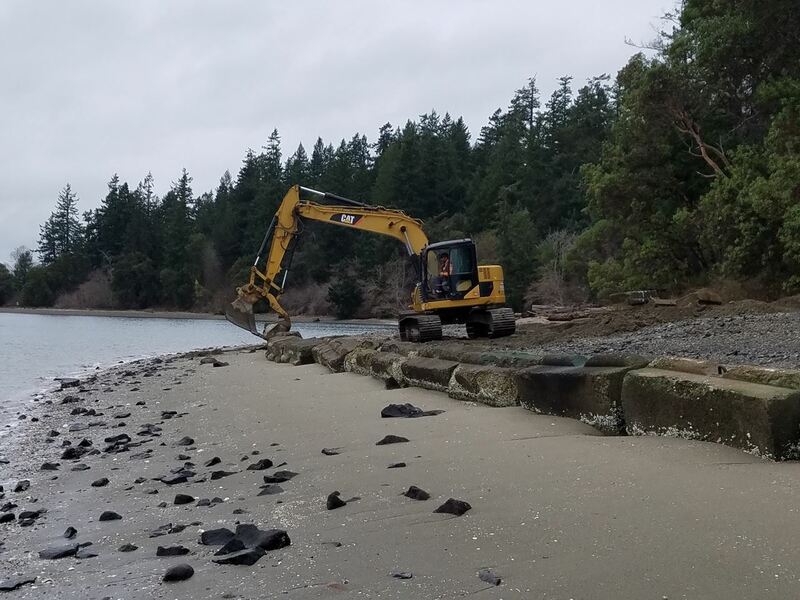 Hugh provides technical assistance to local, state, and federal agencies; participates in a variety of technical and scientific workgroups; and educates property owners and coastal communities about shoreline processes. Hugh received his bachelor's degree in Earth Sciences and Engineering from Dartmouth in 1981 and his masters in Geological Sciences from the University of Washington in 1986. Hugh grew up near the coast of Maine, but moved to the Puget Sound region in 1983. Instructors: Corey Morss is an Environmental Engineer working for the Washington Department of Fish and Wildlife Habitat Program. Corey provides technical assistance to WDFW Habitat Biologists statewide, as well as designing and constructing restoration projects in marine and freshwater environments. Corey has developed and delivered trainings on water crossings, marine shoreline protection (MSDG), fluvial geomorphology, reading engineering plans, and fish friendly construction considerations. Corey is passionate about the outdoors and spends most of his spare time hiking, camping, backpacking, hunting, fishing, boating or dreaming about those things.